For those who are managing websites on behalf of clients, we understand that you want control of your brand’s image. That’s why you can easily change the labeling of our Worker plugin with our White Label tool. 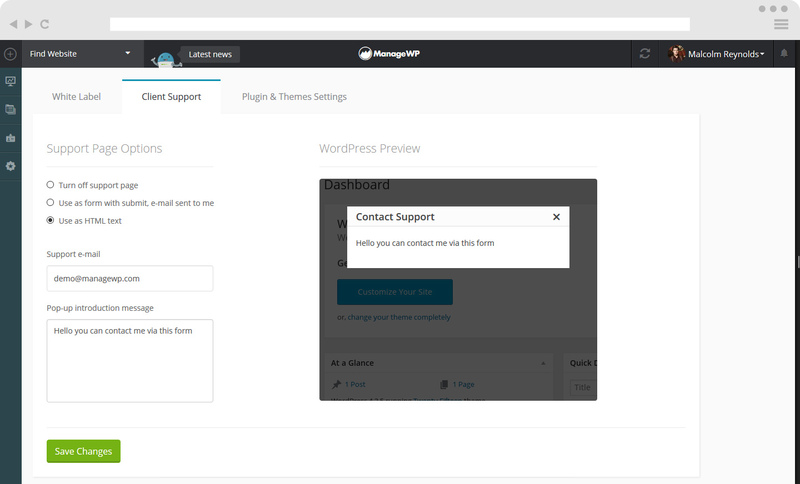 This feature gives you complete control of how ManageWP appears to your clients. Our Worker plugin can easily feature you or your company’s name, along with your explanation of what our plugin does. 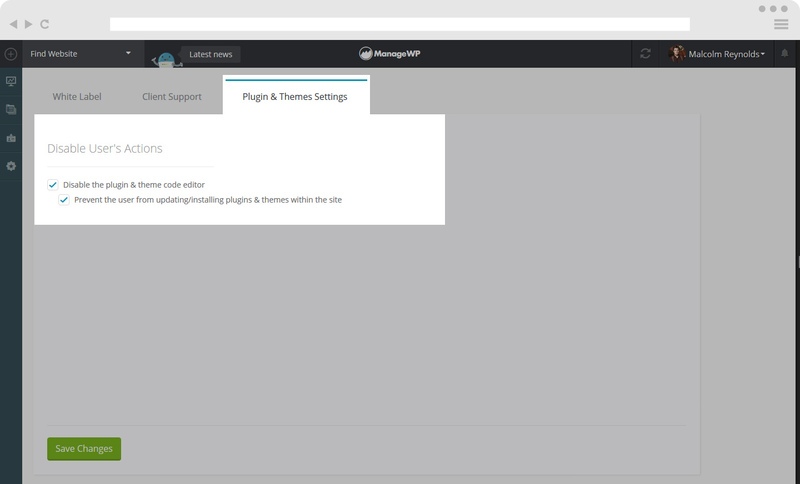 Furthermore, the ManageWP Worker plugin doesn’t need to appear at all! You have full control over the message and maintain your image throughout the ManageWP experience. The White Label tool is located at the top menu of your ManageWP Dashboard when you click on your name for the log in details. On the dropdown menu click on White Label. 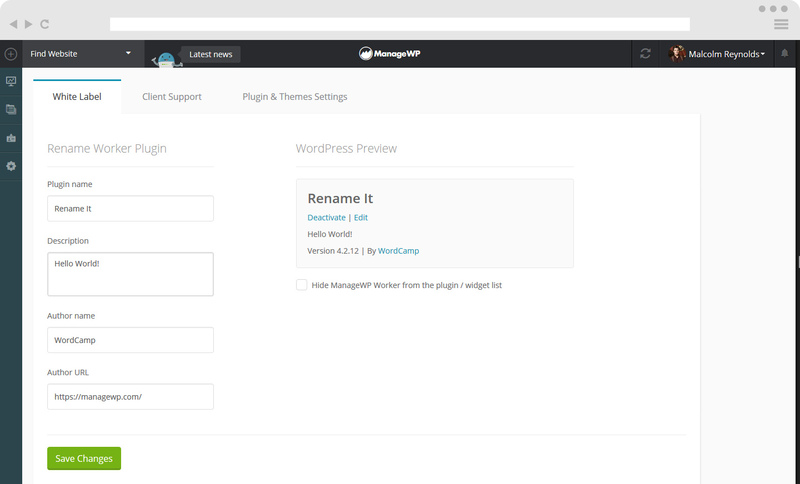 Plugin name – it allows you to rename the Worker Plugin for your websites. It allows you to write a description about your Plugin. You can modify the Author Name and URL. You can also find a checkbox that hides the ManageWP Worker from the plugin / widget list. When you have adjusted the settings click Save Changes. Any user on the website can now contact you directly through the Support tab in the wp-admin sidebar. This is great when you’re supporting a client with multiple team members. It’s easier for them to get in touch with you. You can choose to turn off your support page. You can choose your support email and intro message. Click on the Plugin&Themes Settings. With this option, you’ll hide all the available plugin and theme updates from the site’s wp-admin dashboard. It also disables the code editor. You’ll be able to see and run updates from the ManageWP dashboard.To enable this simply check the box. The White Label tool is located at the top menu of your ManageWP dashboard when you click on your name for the log in details, on the dropdown click on White Label. It allows you to rename the Worker Plugin for your websites. To write a description about your Plugin. N.B. You can also find a checkbox that hides the ManageWP Worker from the plugin / widget list. Any user on the website can now contact you directly through the Support tab in the wp-admin sidebar. This is great when you’re supporting a client with multiple team members. It’s easier for them to get in touch with you, and you’re able to solve issues quicker, much to their delight. With this option, you’ll hide all the available plugin and theme updates from the site’s wp-admin dashboard. It also disables the code editor. 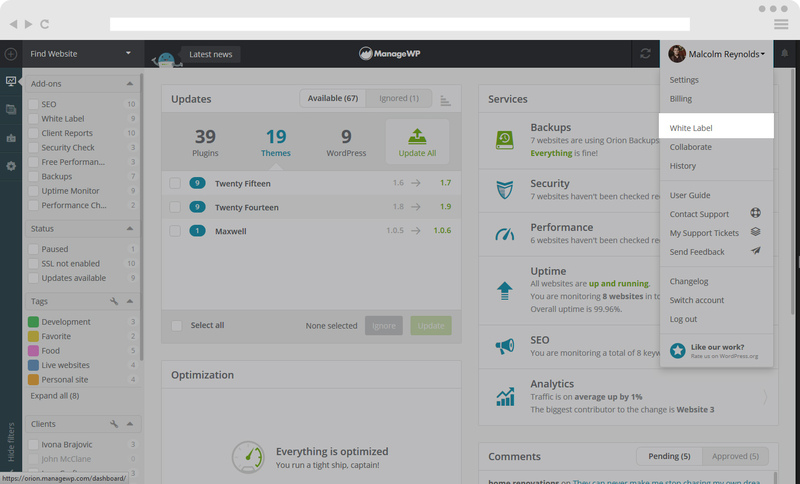 You’ll be able to see and run updates from the ManageWP dashboard. To enable this simply check the box.